Packt Publishing has offered this an interesting book to me for review. It's about using Sketchup for game design. I like using Sketchup but I didn't know that it is good enough to be used for game design. This book shows that it can, and how you can do it. This is a beginner's guide that's made up of step-by-step tutorials that build on one another. The goal is to construct a small town on uneven terrain at the outskirts of a city. It's the setting for a first person shooter game, and it's going to be used as demo where you can walk around the town. To get up to speed, you need basic Sketchup knowledge like modeling and moving things around. The tutorials only cover the essential steps which focuses on finding textures, creating them, and mapping them onto the models. Specifically for game design, it covers how textures are to be manipulated to get them looking good and still not be a drain on computing resources. The guided exercises are all easy to follow along. In addition to Sketchup, the book introduces many free software that are to be downloaded and used for the tutorials. They are Meshlab, GIMP and Unity 3D. Unity 3D is a huge file so you'll want to download it first while reading the first few chapters. The tutorials use GIMP, the Photoshop alternative, to edit pictures. You can still use Photoshop but you'll have to be proficient enough to understand how you can workaround, for example on how you can create seamless textures, because all the steps are written for GIMP. There are many things new to me in this book. One of them is on creating undulating terrain inside Sketchup. I didn't know that was possible, and it's not difficult. There's also a chapter on modeling a car. The result is semi-realistic because the lesson involves building the general shape and mapping the car texture. There are a lot of useful tips and tricks in this book. I learned a lot especially on texturing. 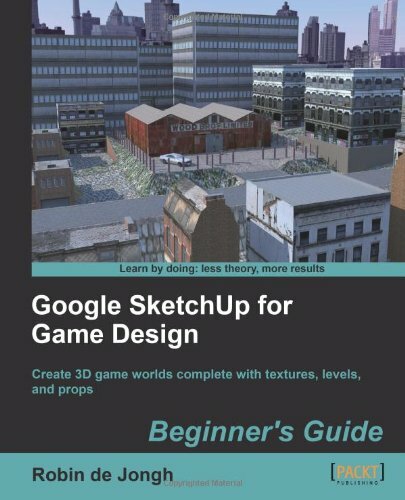 It's a great book on prototype game design with Sketchup. Fun to read and easy to follow. This title is available as an ebook as well, Amazon Kindle, PDF and some other formats I don't recognise. Check out Pack Publishing website for those. This is the Unity 3D software to download. It's enables you to import your Sketchup models into it to create a demo. A free texture package for Google Sketchup that will give you hundreds of additional textures. I didn't know this exists. Very useful. Where you get to model a crate. Creating undulating terrain using Google Sketchup. Mapping texture onto the modeled terrain. The end result of the car modeling tutorial. This is the town that's to be created from the series of tutorials. The whole 3D environment complete with lighting and background textures. I'm interested in this book for the game design classes I teach. I'm Interested in the printed book. I'm from Spain. Many thanks! and off course, i am also interested in it, printed or not ;) but printed always is the better choice. The book really sounds cool. I would be really interested in either edition. I'm interested in learn sketchbook and also I'm videogame enthusiast. would be nice have the digital edition. I'm interested in the print copy (US). Definitely interested. Recently got into 3d modeling for games, so this definitely looks promising. This book looks awesome. I'd like the print edition USA. Also Parka, I am a U.S.
Also Parka, I am a U.S. resident. I would like to have on of the Printed one! Im from Germany! All the best and keep the good work on the blog. Love it! Cheers! And thanks for this blog. Hei, Iam from Norway, should be good any kind of edition (print or digital). Congratulations also for this site. I read the blog and always find great reviews an stuff that help a lot, in the tech and in the inspirational side. Thank you for this great work and keep rocking!! I'm interested in the printed edition of this book. I'm from Italy. Your site is awesome. Thank you. Hi, I´d like to have the book, no matter what version is. I´m from Mexico City. Leigh Way from the UK and I would love any version I can get of this, looks fantastic! I would adore a digital copy of this. I hope this is still open. I do my 3D work in Maya for my environment art, but using sketchup? I'd love to learn how. The giveaway contest is now closed. Thanks for the participation. The winners for the print editions is Retta (Germany) and Chris Scott (USA) and the digital edition Luis (Norway) and Chris (Netherlands). I'll be passing your email contact to the publisher who will be giving out the books.